Hand out wristbands at your big event, whether it is a carnival, festival, birthday party, sporting event, or if you own a bar or club. These wristbands are a great way for showing who has been admitted or who is a certain age. Each wristband is made of a tamper-proof material with adhesive so that once they are removed they can not be used again. The rip-stop material on the wristbands are waterproof so you can hand them out if you own a beach front bar or are taking a large school trip to a water park. Wristbands are a must have for security and reduced liability. We offer a large assortment of colors, as well as specific theme wristbands such as St. Patrick's Day, Casino theme, Mardi Gras, Patriotic, "Drinking Age Verified," and VIP Access. 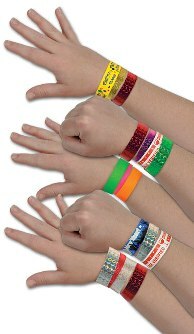 No matter what kind of wristbands you're looking for we've got you covered right here at PartyCheap.com! Use them to show who paid, who is underage, or who is a VIP with these wristbands. Simply peel the bands apart and place them around the wrists of your guests. The Tyvek wristbands are made of a rip-proof fabric like material that can not be removed without destroying the band and will not allow anyone from giving their band to anyone else. All of our plastic party wristbands come in packages of 100 wristbands and add a little extra sparkle to your party guests arms. Each plastic wristband has a one time use plastic 'snap' that is adjustable to any size wrist. Simply snap it on them and it will stay there for as long as they want until they cut it off. Provide an extra level of security for your next event with one of our glittered plastic party wristbands.